This guide is made with the assumption that you already know a thing or two about basic neoHTML. If you don't, there's a great guide in the Neopian Times. Just search "fonts" in the search bar and click on the first article. Now, on to the actual guide. I'm gonna go through the steps of making a font (in this case, a pear) and teach as I go. Keep in mind that the order of these steps doesn't actually matter. You can go about making a font however you want; I just used this format to make the guide easy to use. 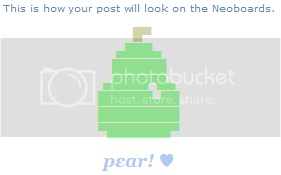 PS: You can use the pear as a premade if you want to! It does not require a Neoboard Pen - not all picture fonts do! Don't take credit for making it, please. Obviously, you need to have a concept behind your font before you start it (usually). Any good font is unique and original, so I devoted a few words to that here. I like pears, so that's what my font is gonna be. :P I'm using the baby buzz avatar because the colors work well for the picture. You can get colors from an avatar with Sunnyneo's online eyedropper (sunnyneo.com/eyedropper). Next, start the actual picture. There are 5 basic blocks to use: █, ▀, ▄, ▌ and ▐ (full, top, bottom, left and right, respectively). There are a lot more block characters out there, but I've found that the 5 above are the only really useful ones because they all have the same width. Experiment if you want, though! The top and bottom blocks can be used to give the illusion of a slope or curve in your picture. Spacing the blocks differently from line to line changes the slope. It's usually easiest not to change the font face of your picture and keep it as the automatic Arial. I talk about using other fonts here, though. Now that the basic design is done, I added some detail to make the pear more pear-like and attractive. On the right side, I gave it a little shine with top and bottom blocks. I also decided to add a stem at the top to add to the pear's pearness, but I had already reached the character limit in the NeoHTML box! To deal with this, I moved down enough stuff down to the NeoSignature box for me to work on the stem at the top. Once I finished that code, I just moved enough code to fill up the NeoHTML box again (it can be very important to fill up both boxes as much as possible because picture fonts take up a lot of code). A frustrating issue for a lot of font makers is creating empty space. Usually, users who can't figure out how to get around this use white letters (with either c=#FFFFFE or c=snow). There's a much better way though! It deals with pasteable spaces, which are basically regular characters which are completely blank. If you've ever tried to push text over with spaces you make with your space bar, you know that they end up showing up as only one space. Although they are extremely helpful, they can be a bit tricky to use. For some reason - I'm not sure what it is - you can't copy-and-paste this space from one source to another. If you have a font saved using these, you may have to add them back in each time you use the font. They are about half as wide as blocks, which can be a bit of a problem (there is an exception, which I explain here). On a PC, you can get these spaces by pressing alt+255 (if you're on a laptop with no number pad, it's alt+fn+255). On a Mac, the shortcut is option+space. A caption isn't always necessary in a picture font. In fact, if your font is clear and accurate enough, a viewer should be able to tell what it is without a caption. Sometimes, you may simply not have enough space for another line of text. If you do decide to add one, it's usually best to keep it simple and focus more on the picture. Adding some alt letters from here can make your caption cool-looking. Since I'm not feeling especially original right now, I'll just make my caption say "pεar! ♥". So why not always use it? Well, "f=monospace" takes up 11 characters, which can make fitting your picture into the code boxes very difficult, especially if your picture has multiple colors and/or you don't have a Neoboard Pen. Courier, another fixed-width face, has fewer characters in its name but it doesn't work in all browsers so I'd advise against using it. Finding inspiration: Originality is important, but it's hard to find. There have been a zillion Christmas trees, hearts, and other clichés because they're easy to make and easy to think of. My advice is to actively look around for inspiration. Check out your favorite avatars or look around your physical surroundings for something that you think would look good. Find something that you can plan out in your head and get started. Try to challenge yourself, too! Planning: For a lot of people, starting a picture font with the top line and working downwards is difficult and a big stumbling block to making any complex font. If you have this issue, I'd suggest trying to create the picture in MS Word or another text editor. Then, you can add the necessary tags and put it into your font! But keep in mind: there is a very tight limit on characters when you're making your font, but your text editor has no limit. Take this into account, especially if you're using multiple colors! which I totally recommend. If you want something more unique, my advice is to keep the letters fairly basic, at least when you're starting out. You can add in more detail later if you want. The font I use to advertise this site is a good example, although you can't make the whole alphabet in this style and the "E" ended up looking a bit funky. If you have any questions or suggestions for this section, please neomail me! I'm always open to suggestions and any other kind of mail but I don't get on every day. I'll try to respond ASAP but don't get upset if I don't send anything for a few days. CSS, images and content are by me (monospace). Credit goes to w3schools for helping me with CSS. Code for the hit counter is by BoingDragon.